It’s always when companies are thinking about dual-SIM phones, they are making something cheap. I don’t know why but it always happens. But BLU is the first company to break the rule. They just announced a powerful dual-core Android smartphone, Vivo 4.3 having a 4.3-inch Super AMOLED Plus screen at the front. Its CPU is Cortex A9, clocking at 1GHz. They also managed to gibe Android 4.0 Ice Cream Sandwich with every device from the day one. There is a 8MP snapper at the back of BLU Android phone with HD shooting as expected. What’s the most promising part of the total table is the price of the phone. They will ship it in US from September only asking $250 for the unlocked device. Gradually it be released on Latin America and Asia. Read the full PR after the break. MIAMI, Aug. 3, 2012 /PRNewswire/ -- BLU Products, one of the fastest growing mobile phone manufacturers in the world, announced the new Vivo 4.3, becoming the first manufacturer to produce a Dual SIM device to include either a Super AMOLED Plus LCD, or Dual Core Processor - realizing increased performance, user experience and capabilities for consumers in emerging markets, as well as non-contract unlocked devices in the United States. "We are extremely excited as we continue to pioneer the growing demand of Dual SIM handsets in emerging markets by offering the most outstanding Dual SIM smartphone available anywhere in the world today." said Samuel-Ohev-Zion, CEO of BLU Products. "Additionally, this is the first in a series of exciting new Android devices we will be announcing, as we are actively and aggressively moving towards providing high performance, affordable smartphones to the ever growing unlocked no-contract segment in the United States." The Vivo 4.3 features no physical hardware buttons on the front to ensure a seamless elegant design, and is run by a MediaTek MT6577 dual core 1GHz Cortex™-A9 CPU with 3G/HSPA connectivity, running the latest Android 4.0 Ice Cream Sandwich Operating System. Additionally, the Vivo is designed to deliver high-end multimedia capability, with an 8MP camera, plus HD video recording and playback. The highlights of the phone include the rich viewing experience of the brilliant Super AMOLED Plus 4.3" Display, along with true dual SIM capability allowing both SIMs to be active and receive calls simultaneously. The unlocked VIVO 4.3 will begin shipping to major US Retailers in September 2012 with an MSRP of $249.99 and will soon follow through Latin America, and parts of Asia. BLU Products, founded in 2009, designs affordable, attractive and innovative mobile devices to suit a wide variety of consumer needs. Over four million BLU mobile devices have been sold in over 40 countries. 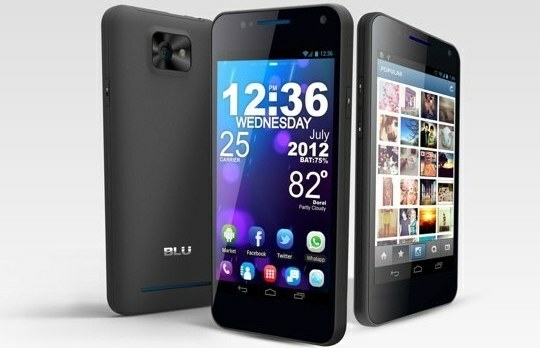 Headquartered in Miami, Florida, BLU is one of the fastest-growing mobile phone manufacturers in the world. For more information, visit: www.bluproducts.com.